Download "GUIDE TO MOVING. We can give you a breakdown of the costs involved"
1 GUIDE TO MOVING "I'll never do this again!" So many people say this at some stage when they are buying and selling a house that we have prepared this guide to assist you. It outlines how the transaction should proceed and is part of our commitment to making your move as painless as possible. Solicitors sometimes use terms which may be confusing to clients, especially first-time buyers. Therefore at the end of this document we have also prepared a Glossary of Terms in which we explain some of the common terms during a conveyancing transaction and in order to help you understand this guide. THE SALE 1. Contact us as soon as a Buyer has been found so that: We can apply for the title deeds from the lender, to ensure that there is no delay in issuing a contract once negotiations have been finalised. We can give you a breakdown of the costs involved You can complete a Seller s Property Information Form and Fixtures and Fittings List to enable us to issue the contract promptly. 2. A draft contract will be issued to the buyer s solicitors, together with all the necessary supporting documents. When the contract has been approved, we will ask you to sign it in readiness for exchange of contracts. 3. When the buyer has received their local search and mortgage offer and their solicitor is satisfied as to the title, we will negotiate a completion date and the deposit. Contracts can then be exchanged. This is the stage when you will be legally committed to the move. 4. On the day of completion, you must ordinarily clear and vacate the property by 12 noon, leaving the keys with the estate agents or having made other arrangements direct with your buyer. We will redeem your existing mortgage and settle the estate agent s account. THE PURCHASE 1. When you have agreed to purchase a property, the estate agent may require you to pay a deposit. We would urge you against making any such payment as this should be done through ourselves. Please let us know if you have paid such a deposit. 2. When you let us know you have found a suitable property we will ask you for money on account, so that we can carry out the preliminary searches on your behalf. 2 3. When we receive the contract from the seller s solicitor, we will: Apply for the local search, and any other searches we consider appropriate. Send you a copy of the Fixtures and Fittings Form so that you can check what items are included in the purchase price. Approve the contract and title. We may feel it necessary to raise additional enquiries of the seller s solicitor. When we are satisfied that all is in order, we will return one copy of the contract to the seller s solicitors for signature in readiness for exchange of contracts 4. If you require a mortgage, the offer has to be received from the lender before exchange of contracts. 5. If you are arranging any new endowment or life policies, acceptance of risk must be received from the insurance company before exchange of contracts. 6. Once we have satisfied ourselves as to title together with proof that the seller owns the property and that any legal matters will not affect your use or enjoyment of the property, we will report to you and ask you to sign the contract and mortgage deed. We will also ask you for the deposit to be used on exchange of contracts. If you have a related sale, we will usually be able to arrange that the deposit received from your buyer is used for your purchase and passed up the chain. 7 We check your mortgage offer when received and report to you outlining the main points so that you understand your obligations under it. We arrange for you to then sign the mortgage deed. THE EXCHANGE 1. At this stage, we are ready to arrange an exchange of contracts once a completion date has been agreed. It is at this stage, that stress levels rise! However, we are here to help. The majority of people buying and selling are involved in A CHAIN! This means that there is a linked series of transactions and EVERYBODY wants to sell and buy on the same day so that they do not have to pay for bridging finance or rented accommodation. We therefore have to wait until all parties in the chain have: (d) A mortgage A local search Title approved Agreed the completion date We will liase with the estate agents and other solicitors until the exchange has been achieved. 2. When exchange has taken place, the completion date is legally binding and you can now swing into action and organise your move. The following are just a few reminders of the things you should deal with: (d) (e) (f) (g) Arrange contents and buildings insurance (we can provide a quote for this) Contact gas, electricity, water and telephone services. Arrange for meters to be read and accounts to be transferred Book the removal van. Cancel banker s order for mortgage payments after exchange of contracts Notify the local authority of your move and arrange apportioned account for council tax Arrange for friends to look after the children and pets on moving day! Arrange for mail to be re-directed. 3 COMPLETION 1. We will let you have a statement showing all the costs and disbursements due and will draw this up as soon as possible so that you can arrange to let us have any balance at least five days before completion. We need cleared funds in our account including all our legal fees in order to complete. 2. On completion day, if you have a sale, we must wait for the buyer s solicitor to send us the sale money by telegraphic transfer before we can send out the money by the same method on your purchase. This means that it is unlikely that you will get the keys to your new house before lunchtime on the day of completion. We would suggest that you do not leave your old house before you have checked with us that it is in order for you to do so. If you just have a purchase, we can usually send the money quite early on the morning of completion, but you are unlikely to get the keys before midday because you must allow the seller time to vacate the property. 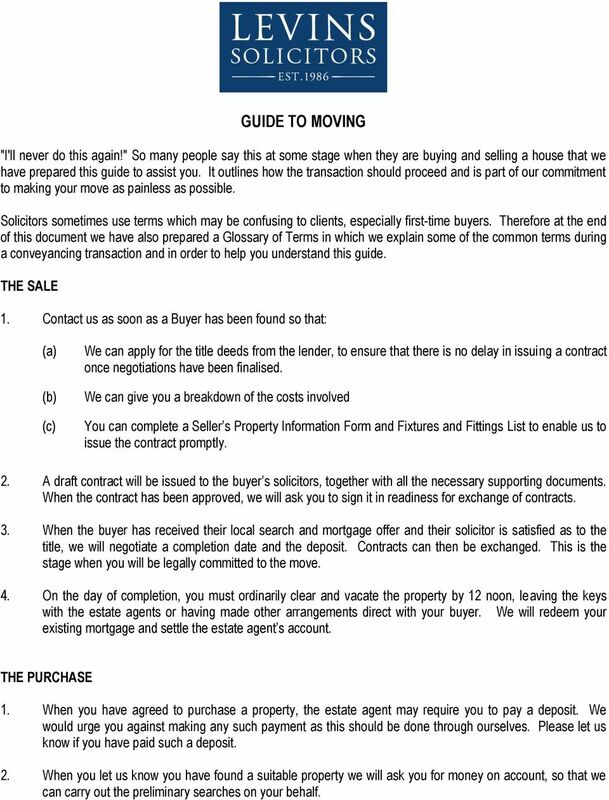 FINALLY We hope this guide will be of some assistance and remove some of the uncertainty associated with moving house. However, if at any time you have any questions then please do not hesitate to contact us. We are here to help you! Finally if you are happy with our service then please tell others if not then please tell our Mr Flett. 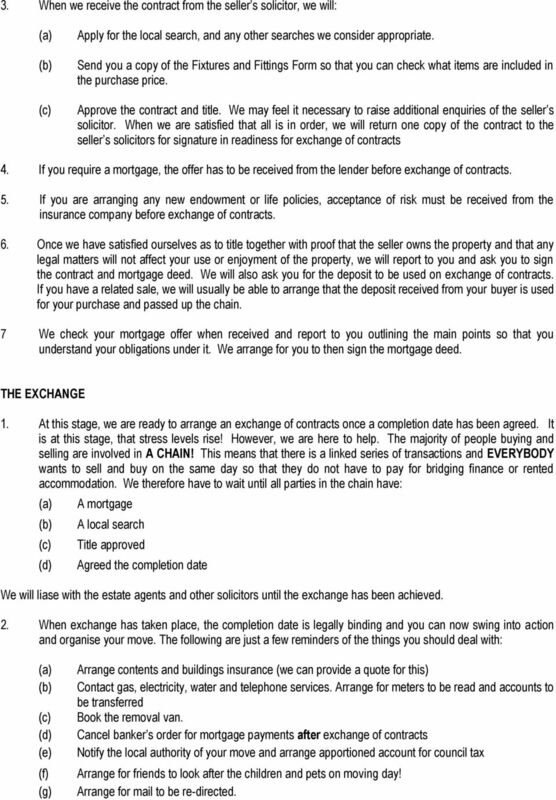 4 GLOSSARY OF TERMS COMPLETION DATE This is the date that ownership of the property passes from the seller to the buyer and the date is usually fixed on exchange of contracts (see below). The seller and buyer should discuss dates between themselves and then notify their respective solicitors who will try to fit in with any suggested dates. If there are unforeseen delays, for example, if the buyer does not receive a search or mortgage offer in time, or the "cash buyer" turns out to have a related sale then the completion date may have to be changed. For this reason you should not make any firm commitments such as giving notice on a job, arranging removals or making holiday bookings without first contacting us so that we can advise you of the situation. CONTRACT This is the agreement between the buyer and the seller. It sets out the main terms of what has been agreed such as the property, the price and the names of the parties. It also deals with matters should something go wrong. 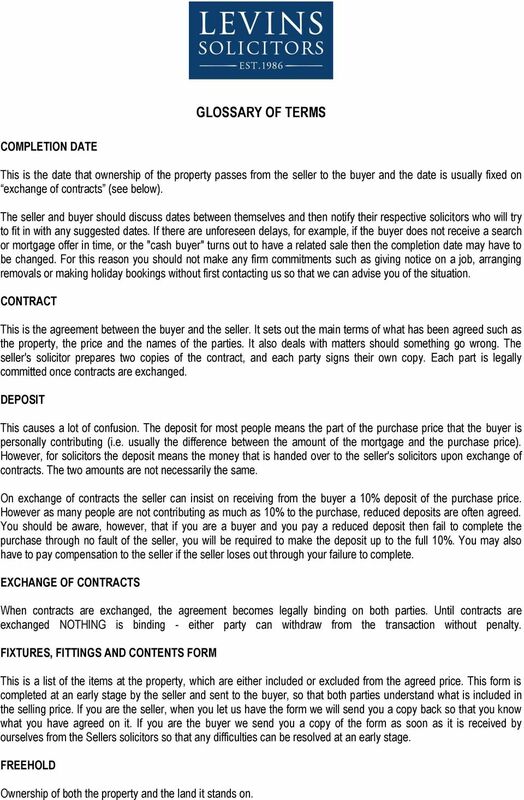 The seller's solicitor prepares two copies of the contract, and each party signs their own copy. Each part is legally committed once contracts are exchanged. DEPOSIT This causes a lot of confusion. The deposit for most people means the part of the purchase price that the buyer is personally contributing (i.e. usually the difference between the amount of the mortgage and the purchase price). However, for solicitors the deposit means the money that is handed over to the seller's solicitors upon exchange of contracts. The two amounts are not necessarily the same. On exchange of contracts the seller can insist on receiving from the buyer a 10% deposit of the purchase price. However as many people are not contributing as much as 10% to the purchase, reduced deposits are often agreed. You should be aware, however, that if you are a buyer and you pay a reduced deposit then fail to complete the purchase through no fault of the seller, you will be required to make the deposit up to the full 10%. You may also have to pay compensation to the seller if the seller loses out through your failure to complete. EXCHANGE OF CONTRACTS When contracts are exchanged, the agreement becomes legally binding on both parties. Until contracts are exchanged NOTHING is binding - either party can withdraw from the transaction without penalty. FIXTURES, FITTINGS AND CONTENTS FORM This is a list of the items at the property, which are either included or excluded from the agreed price. This form is completed at an early stage by the seller and sent to the buyer, so that both parties understand what is included in the selling price. If you are the seller, when you let us have the form we will send you a copy back so that you know what you have agreed on it. If you are the buyer we send you a copy of the form as soon as it is received by ourselves from the Sellers solicitors so that any difficulties can be resolved at an early stage. FREEHOLD Ownership of both the property and the land it stands on. 5 LAND REGISTRY A central body that retains records of who owns land and property in England and Wales and under what conditions. Not all land and property is registered today. This is partly due to the fact that land can only be registered following certain "triggering events". The Land Registry has its own website which provides useful information. LEASEHOLD An interest in property for a certain period of time. When the lease expires ownership of the property reverts back to the freeholder. LEGAL FEE This is a fixed cost that covers the cost of the time our solicitors spend on your conveyancing. 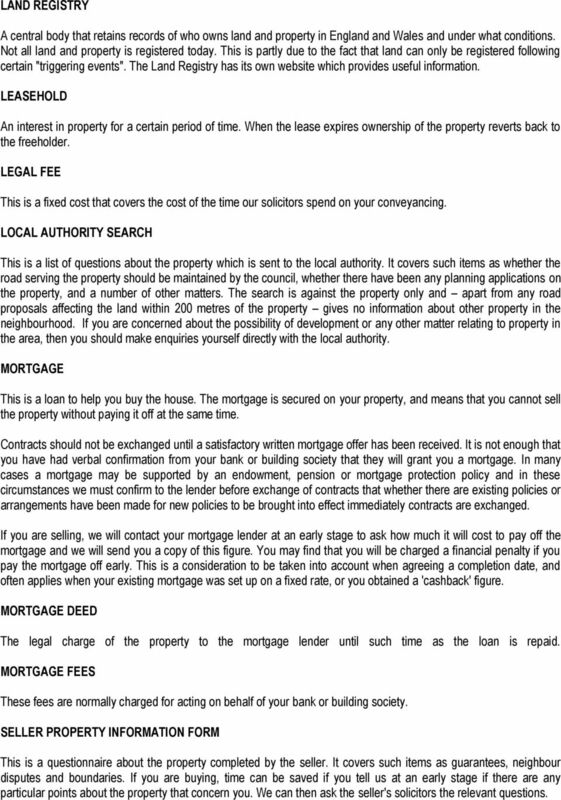 LOCAL AUTHORITY SEARCH This is a list of questions about the property which is sent to the local authority. It covers such items as whether the road serving the property should be maintained by the council, whether there have been any planning applications on the property, and a number of other matters. The search is against the property only and apart from any road proposals affecting the land within 200 metres of the property gives no information about other property in the neighbourhood. If you are concerned about the possibility of development or any other matter relating to property in the area, then you should make enquiries yourself directly with the local authority. MORTGAGE This is a loan to help you buy the house. The mortgage is secured on your property, and means that you cannot sell the property without paying it off at the same time. Contracts should not be exchanged until a satisfactory written mortgage offer has been received. It is not enough that you have had verbal confirmation from your bank or building society that they will grant you a mortgage. In many cases a mortgage may be supported by an endowment, pension or mortgage protection policy and in these circumstances we must confirm to the lender before exchange of contracts that whether there are existing policies or arrangements have been made for new policies to be brought into effect immediately contracts are exchanged. If you are selling, we will contact your mortgage lender at an early stage to ask how much it will cost to pay off the mortgage and we will send you a copy of this figure. You may find that you will be charged a financial penalty if you pay the mortgage off early. This is a consideration to be taken into account when agreeing a completion date, and often applies when your existing mortgage was set up on a fixed rate, or you obtained a 'cashback' figure. MORTGAGE DEED The legal charge of the property to the mortgage lender until such time as the loan is repaid. MORTGAGE FEES These fees are normally charged for acting on behalf of your bank or building society. SELLER PROPERTY INFORMATION FORM This is a questionnaire about the property completed by the seller. It covers such items as guarantees, neighbour disputes and boundaries. If you are buying, time can be saved if you tell us at an early stage if there are any particular points about the property that concern you. 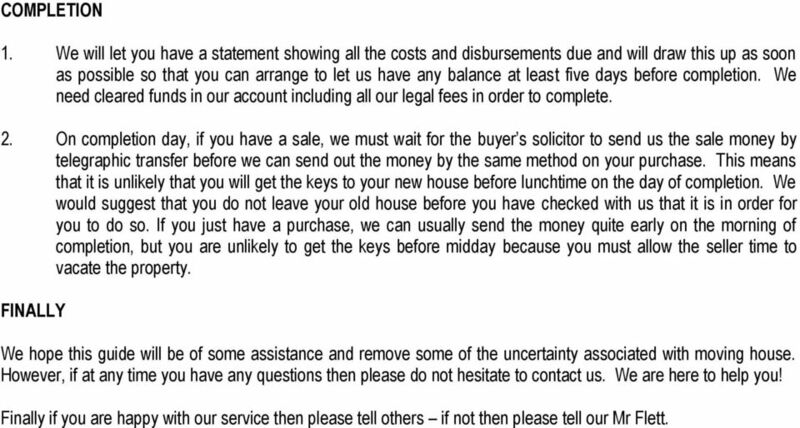 We can then ask the seller's solicitors the relevant questions. 6 REDEMPTION The final payment of a mortgage loan. REDEMPTION FEE A penalty or additional charge which may be incurred if paying off a mortgage early. 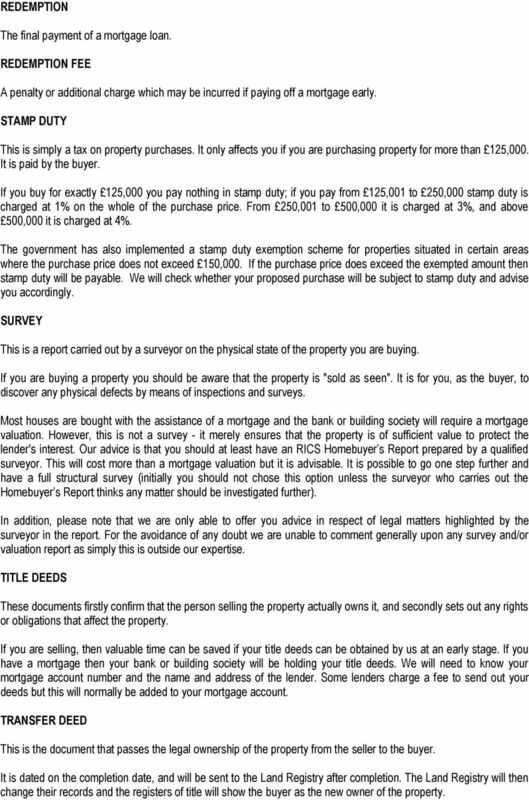 STAMP DUTY This is simply a tax on property purchases. It only affects you if you are purchasing property for more than 125,000. It is paid by the buyer. If you buy for exactly 125,000 you pay nothing in stamp duty; if you pay from 125,001 to 250,000 stamp duty is charged at 1% on the whole of the purchase price. From 250,001 to 500,000 it is charged at 3%, and above 500,000 it is charged at 4%. The government has also implemented a stamp duty exemption scheme for properties situated in certain areas where the purchase price does not exceed 150,000. If the purchase price does exceed the exempted amount then stamp duty will be payable. We will check whether your proposed purchase will be subject to stamp duty and advise you accordingly. SURVEY This is a report carried out by a surveyor on the physical state of the property you are buying. If you are buying a property you should be aware that the property is "sold as seen". It is for you, as the buyer, to discover any physical defects by means of inspections and surveys. Most houses are bought with the assistance of a mortgage and the bank or building society will require a mortgage valuation. However, this is not a survey - it merely ensures that the property is of sufficient value to protect the lender's interest. Our advice is that you should at least have an RICS Homebuyer s Report prepared by a qualified surveyor. This will cost more than a mortgage valuation but it is advisable. It is possible to go one step further and have a full structural survey (initially you should not chose this option unless the surveyor who carries out the Homebuyer s Report thinks any matter should be investigated further). In addition, please note that we are only able to offer you advice in respect of legal matters highlighted by the surveyor in the report. For the avoidance of any doubt we are unable to comment generally upon any survey and/or valuation report as simply this is outside our expertise. TITLE DEEDS These documents firstly confirm that the person selling the property actually owns it, and secondly sets out any rights or obligations that affect the property. If you are selling, then valuable time can be saved if your title deeds can be obtained by us at an early stage. If you have a mortgage then your bank or building society will be holding your title deeds. We will need to know your mortgage account number and the name and address of the lender. Some lenders charge a fee to send out your deeds but this will normally be added to your mortgage account. TRANSFER DEED This is the document that passes the legal ownership of the property from the seller to the buyer. It is dated on the completion date, and will be sent to the Land Registry after completion. The Land Registry will then change their records and the registers of title will show the buyer as the new owner of the property. Buyers Guide. If you have a property to sell, the first step you should take is to put it up for sale. Guide to Selling and Buying your Home Selling and buying property can be one of the most stressful periods in anyone s life. So, what can you do to ensure that the process goes as smoothly as possible? Residential Property Glossary of terms The conveyancing process is unfortunately full of legal jargon, so we have produced this glossary to help you if you come across something you do not understand. Conveyancing Guide Making your Home yours..
Solicitors for property advice As specialists in property law, Millbank Solicitors provide expert legal advice whether you are buying or selling your property, remortgaging or involved in a property dispute. If you need any advice or wish to discuss what type of report you should instruct, please let us know. HOME HOME SWEET. QualitySolicitors Burn & Company. A guide to buying and selling property. A Guide To Your Real Estate Purchase Buying real estate is always an exciting experience but sometimes, it can also be daunting. This information is provided to help your purchase proceed quickly and efficiently. HOME HOME SWEET. QualitySolicitors Parkinson Wright. A guide to buying and selling property. Thinking of buying? Your right to buy your council home Buying your home is probably the biggest financial decision you will ever make so it s important to consider whether it is the right choice for you. Thinking of Buying Your Council Flat? Do I Need A Solicitor To Sell My House in NSW?